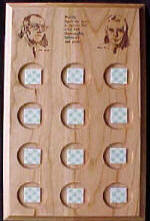 Founders - Rarely Have We Seen ... Hardwood Laser Engraved Twelve Medallion slots. Angle cut. Approximate size: 11-1/4" x 6-3/4" x 3/4" Slotted back for hanging.